We’re big fans of blogging. That’s because blogging for your brand can make it look great online — it fills your site with organic content search engines love and it lets you establish yourself as an expert in your field. But here’s the thing: You’ll only experience the real benefits of blogging if you write stuff people want to read. And the first things people see that help them decide if your content is worth their time? Headlines. Here’s how to write ones that resonate and make your readers want to keep on reading. It’s hard to stand out in the crazy amount of content that exists online. For your headline to have a chance, it has to be unique. That means choosing uncommon words and taking a creative approach. Do some research to see who else has written about what you’re posting. Check out their titles and make sure yours is different — and better. Your headlines need to be creative, but they definitely shouldn’t be ambiguous. After reading your headline, people should know what your post is about and the benefit they’ll get from reading it. For example, what’s the benefit of reading How to Make a Winning First Impression Online? Impressing people with your online presence! Highlight why people need to know what you’re talking about and give them incentive to keep reading. Our brains love when titles have numbers in them. Starting your headline off with a digit helps it stand out. 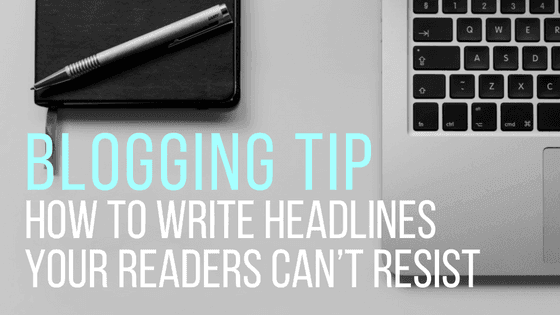 And a title like 5 Blogging Best Practices lets readers know the post is broken down into easy-to-read points and takeaways. People gravitate toward posts they can scan, so add a numbered list and make yours so easy to read that they can’t resist. 4. Don’t forget your audience. It’s not enough to just come up with headlines you dig. Your headlines need to resonate with your audience. Research the way your readers communicate. Are they professional or casual? Serious or silly? Whatever their communication style is, make sure you’re speaking their language. And don’t forget to talk directly to your audience by writing in the second person (i.e., you and your). 5. Brainstorm — and go easy on yourself. Really good titles rarely come to you right away. Usually what you need most is some inspiration from a brainstorming sesh and some time. Come up with a few options, ask for opinions, and if you’re still not sure if you have a winner, come back to it. The right headline might come to you when you least expect it (the best ones usually do). If you’re looking to maximize your brand’s presence online, we can help. Mopro’s blogging platform makes blogging for your business easy. Call 844-207-9038 or email hello@mopro.com to learn more about how we can help you stand out online.